Nestled up against Lost Coaster of Superstition Mountain is the Antique Autos ride. It seems to project over the water too, as much of Indiana Beach must. We'd be game for it anyway and with the loss of one of the antique car rides at Cedar Point we were sure to ride it. It hasn't got much space, as nothing in the park does. 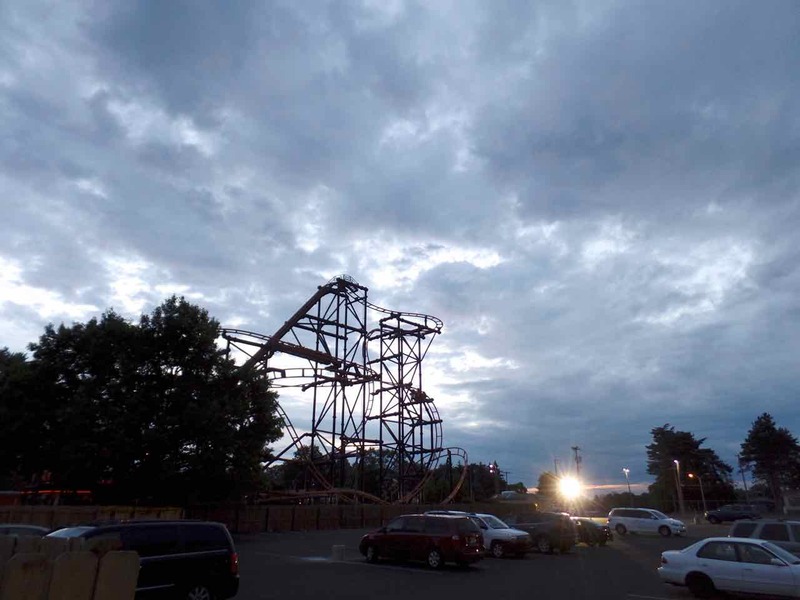 St can't wend its way along much scenery besides what's already at the park, and Lost Coaster --- there's parts where it's hard to tell from afar which is the car ride and which the roller coaster --- and the Hoosier Hurricane off to its side. Also the ride rises and falls which does much to add to the appeal of the thing. Simple rides don't need to be boring ones, not with a little effort put into making them unique. The signs by the ride list Antique Autos as a ``Mild Thrill'' ride. I offer no theories to how this can be. Also in the loading station under the rules I noticed a bagged sheet listing the height requirements for everything at the park. One of the few upcharge attractions at the park is Dr Frankenstein's Haunted Castle. 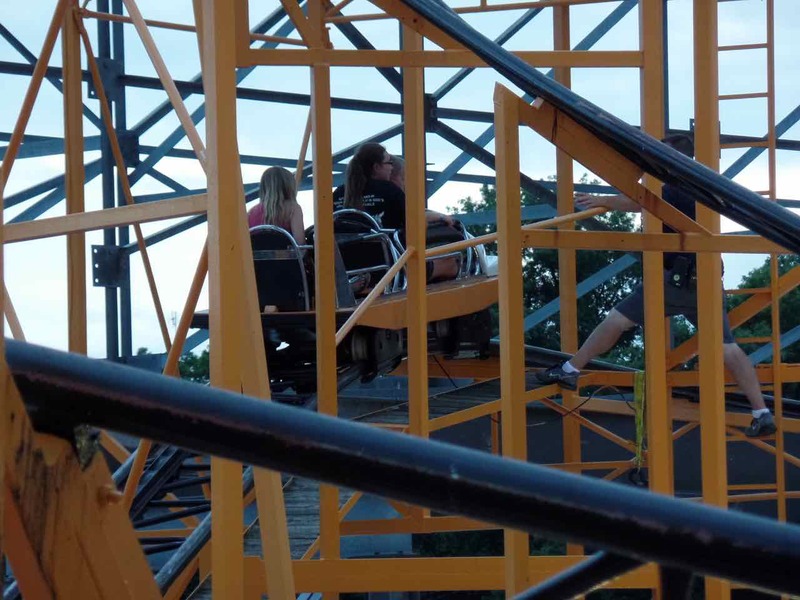 (It's also the only one we would go on, as the other upcharge attractions were a zip line and that ``Skycoaster'' thing where you swing by a cable between two towers. It would take more coaxing than they can do to get the two of us onto either.) Dr Frankenstein's Haunted Castle won Amusement Today's Golden Ticket awards for the World's Best Funhouse/Walkthrough Attraction in 2008 and 2009, something we didn't realize at the time. I didn't, anyway. bunny_hugger had ben on it before and knew some things to anticipate and try to watch my reactions to. It's a good one, no question. It's got a nice bunch of props and stunts and doesn't lean on any one gag too often. And it was just busy enough we could hear muffled bits of other people going through the attraction while still feeling alone in the place, a good haunted vibe. There's chances to climb all around the place, including a brief patio walk, though not near the animatronic Dr Frankenstein who takes his hat and head off to the passers-by. And there's a grand view, several storeys tall, at the climax of the stunts. At this point we almost got stuck as we couldn't find the door hidden into the wall for the walk down. And at the end of the walk down you go through that several-storey room, giving something to look at, including the chance to wait for other parties and see their reactions. We didn't catch anyone at that. Great walkthrough, though it's going to have a hard time taking back the Best Funhouse/Walkthrough Attraction from Kennywood's Noah's Ark, which got a major renovation and huge improvement this year. In the 19th century fishing and game enthusiasts arranged for Asian carp to be brought over to the United States and stocked in major rivers, there to give anglers something new to catch and eat. A little after this they discovered that nothing eats carp, including fishermen. 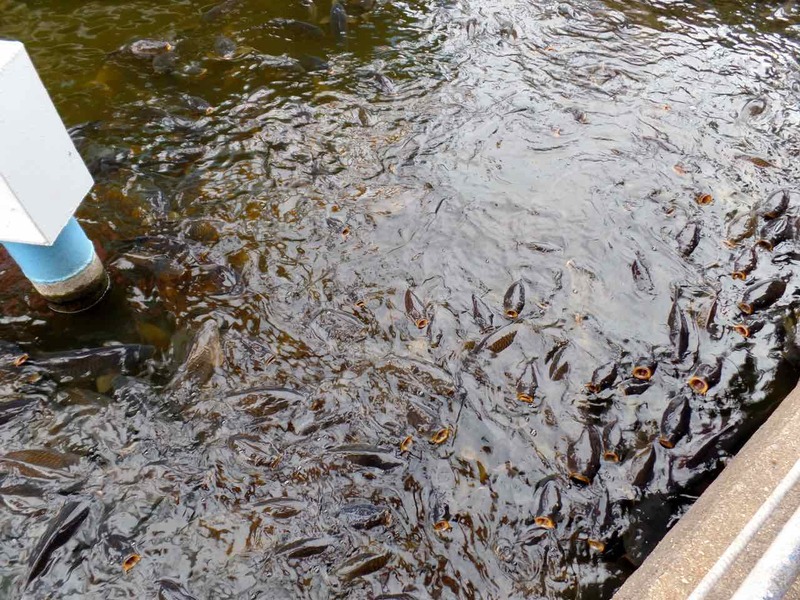 And now we can benefit from major rivers being nearly 85 percent Asian carp by volume. The Tippecanoe River/Lake Shafer is so afflicted. Indiana Beach makes something of this by selling ice cream cones full of carp food for a dollar each and we joined in. We speak of the goldfish making our backyard pond boil by their enthusiastic bobbling around the surface at feeding time. There's only 56 (we believe) of them. Carp are nowhere near so limited. And they know the meaning of the feed stand. At the first pellet a mass of roughly 800 billion of them come scrabbling up, rising out of the sea and forming a gigantic carp-hand to grasp at you and drag you down to the sedimentary base of the reservoir. And I'm only exaggerating a little bit. What you do get is a field of enormous carp gaping their jaws wide open and glaring at you in a vision that will haunt your nightmares for years to come. We got to trying to drop a pellet directly into one's mouth, but we never quite made it. The fish kept knocking each other around. We got a few on the rebound, though. If you ever need to feel like a magician, then I recommend getting a cone full of carp food and choosing where you wish the water to erupt. It does make you feel needed. We'd spend some time exploring the arcades, finding they had a card-based payment scheme instead of just putting money into things. We did play a round of the shooting gallery, tucked beside Dr Frankenstein's Haunted Castle because something had to go there. And we went to one of the indoor game centers to play Fascination. Fascination's a ball-rolling game, with the objective being to complete a Bingo-style line before anyone else. It's got a game-runner and you are competing against everyone else in the room. There aren't many Fascination parlors left; the electronics is a terrifically complicated gizmo that I heard somewhere was based on telephone relay systems. And the game's at its best when you're playing against many other people, in order that each roll is all that much important and infuriating when it goes awry. There were only a couple people playing beside us when we bought five-dollar cards and joined in, too bad. bunny_hugger would win a couple rounds, and I would win one, and we got a good haul of redemption tickets I'm not sure we turned into any actual prize. During some slow time the person running the Fascination parlor chatted about how we liked the place and if we'd been here before and congratulations on our anniversary. She also mentioned that they hadn't had any of the redemption games open last year. Indiana Beach, allegedly, hadn't had enough prizes to give away. It's hard to believe --- even Conneaut Lake Park is able to support a couple redemption game booths --- but it does fit with tales of how badly off the park was before the buyout. Now, everything's changed and the Fascination runner thought the park looked better than it had in ages. bunny_hugger thought it looked about as good as it had last time she visited. 2015 must have been a heck of a year. Trivia: Enraged crowds charged at water polo referee Bela Komjadi in the 1932 Los Angeles Games, after he called forty fouls on Brazil compared to Germany's four. Germany won the water polo match 7-3. Source:	 Encyclopedia of the Modern Olympic Movement, Editors John E Findling, Kimberly D Pelle. PS:	Some Mathematical Tweets To Read, none of which I wrote, but if I gather enough of them together it's almost like I wrote something, right?